The design of this tool is simple and this design allows its easy transportation and usage. The color of it is black, with a weight of 184 grams approximately. Dimensions of the tool are 18.5 cm (Length) x 6.2 cm (Width) x 2.8 cm (Height). Typically, the material used to make this tool is hard plastic, however, aluminum is used to fabricate the ruler placed at its bottom. It measures in inches as well as in cm. These aspects of accuracy and range are most critical to obtain straight lines. 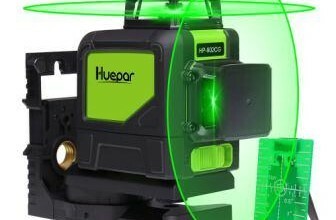 The laser accuracy is adequate and works quite efficiently at a distance of 20 feet as well. The tool consists of an 8-foot tape measurement which locks upon pushing out. Also, it includes measurements that are metric liner as well as imperial type with gradations as low as 1 mm and 1/32″. This tool of ‘Qooltek Multipurpose Laser Level includes 3 important laser settings i.e.horizontal, cross and vertical. Also, it consists of a bubble level that is angled at 45°, this can be utilized during the shelves installation. The maximum output of the laser is less than 0.5 mW. 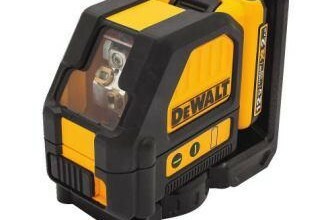 The laser light of the tool consists of a power switch to put it off/on. This tool isn’t magnetic in nature. However, it can be fixed to a tripod that is adjustable. Upon turning on the unit, the wall reflects a red light from the laser. 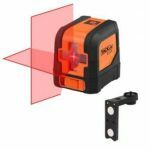 This helps in the adjustment of the tripod height thereby the pictures can be easily aligned or leveled along the line of the red laser. 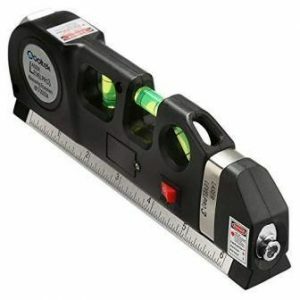 This ‘Qooltek Multipurpose Laser Level’ measures at a level of 8 feet. It also comprises a standard measuring tape ruler which can be adjusted with a metric ruler (-44%). 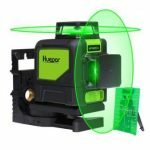 This tool is a multipurpose type of laser level. This lets you carry out multiple tasks quite efficiently. The accuracy of the tool is adequate. The tool is fabricated with materials that are sturdy which render its durability. It is accompanied by batteries (spare) which are long-lasting. This tool is excellent for applications that are indoor, but for tasks that are outdoor, this tool does not function well. Tape for measurement that is 8-feet long doesn’t suffice for projects of construction. Altogether, this tool i.e. 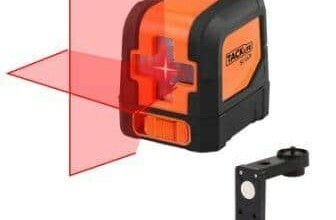 ‘Qooltek Multipurpose Laser Level’ is quite a handy and beneficial tool. Considering that it is user-friendly, it becomes beneficial in multiple applications. For example, to draw lines in order to paint stripes or for hanging a variety of stuff. Also, since it is lightweight, it is conveniently moved about from place to place. This makes work very easy as well. Is this tool worth buying? Well, considering the pros it accompanies, it is perfect to conclude that it is surely worth a buy.